There are many creative garden ideas out in the world. One of the most family friendly and fun is making cement planters. The materials needed are easy to get and the cost is minimal, but the results are as varied as your imagination. Whether you want traditional round concrete flower pots or snazzy rectangular planters, the sky is the limit with a little cement and know how. Concrete doesn’t seem to be a medium that translates in the natural garden, but it can add some interest and inspiration with your creative touches. Plus, it is easy to work with and can even be tinted to suit personal preferences. 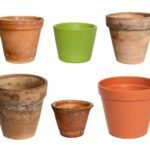 You can customize them to almost any size, with concrete planter ideas that are grandiose or diminutive cuties for succulents and smaller plants. 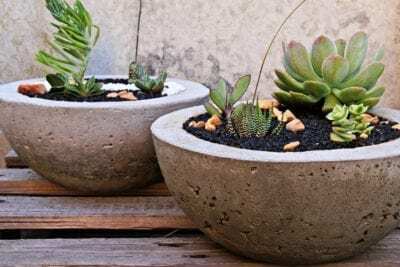 We’ll walk through some basic DIY cement planters that will inspire you and give you the tools to get started on your own. Making cement planters starts with a form of some sort. This depends largely on the size and shape you want. For a beginner, plastic containers of any shape make a perfect start but a more adventurous crafter may want to make their own form out of plywood. You will need two forms, one smaller than the other. Tupperware, empty food containers or specially purchased forms will do for easy projects. Screwed together plywood forms can allow for larger, more interesting shapes. Go round, vertical, oval, square, put a large planting space or a little one, whatever strikes your mood. Once you have a form for your DIY cement planters, you need the rest of the materials. Quick setting concrete will get your project finished more quickly but you can also use standard cement. 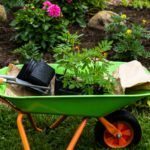 Once you have your cement, you will need a bucket or wheelbarrow in which to mix the powder, as well as a ready water source. The most important step is to prepare your forms so the concrete comes out easily. Coat each form with cooking oil. Completely cover the inside of the larger form and the outside of the smaller. 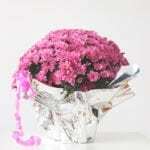 You may also choose to line them with aluminum foil and pan spray. Taking time to do this thoroughly will ensure an easy extraction of the forms. Mix the concrete well until creamy, thick. For concrete flower pots, add a generous amount to the exterior larger form until almost filled to the top. Then nestle the interior form into the concrete, pushing out excess cement. If using a plywood form, nestle the interior form upside down in the larger shape before adding concrete. This will make a large planting container. Fill around the interior shape and use a wooden stick to push out air bubbles. Drainage holes are made by either coating dowels with petroleum jelly and pushing them through the bottom or drilling them out with a cement bit later after the substance cures. In about 18 hours, you can remove the inner form and the dowels. Wait 24 hours before removing the outer form. Coat the planters with masonry seal if you wish or keep them natural. After a few of these, you will be ready to move on to larger projects like a bench or bird bath.